The theory of directed graphs has developed enormously over recent decades, yet this book (first published in 2000) remains the only book to cover more than a small fraction of the results. New research in the field has made a second edition a necessity. Substantially revised, reorganised and updated, the book now comprises eighteen chapters, carefully arranged in a straightforward and logical manner, with many new results and open problems. As well as covering the theoretical aspects of the subject, with detailed proofs of many important results, the authors present a number of algorithms, and whole chapters are devoted to topics such as branchings, feedback arc and vertex sets, connectivity augmentations, sparse subdigraphs with prescribed connectivity, and also packing, covering and decompositions of digraphs. Throughout the book, there is a strong focus on applications which include quantum mechanics, bioinformatics, embedded computing, and the travelling salesman problem. Detailed indices and topic-oriented chapters ease navigation, and more than 650 exercises, 170 figures and 150 open problems are included to help immerse the reader in all aspects of the subject. 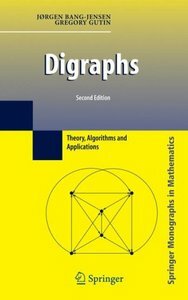 Digraphs is an essential, comprehensive reference for undergraduate and graduate students, and researchers in mathematics, operations research and computer science. It will also prove invaluable to specialists in related areas, such as meteorology, physics and computational biology. Jørgen Bang-Jensen is a Professor in the Department of Mathematics and Computer Science at the University of Southern Denmark, Odense, Denmark. Gregory Gutin is Professor of Computer Science at Royal Holloway College, University of London, UK.